Pursell Farms is an Alabama-based resort and destination golf course. In addition to providing accommodations and world-class golf, they also feature several dining options, a spa, shooting and recreation activities, and packages for both weddings and corporate events. Pursell came to us in need of a website redesign and to support the integration of a booking engine, allowing website visitors to book lodging and tee times. When the Pursell team first introduced the idea of redesigning their website, I was extremely excited. They had been an SEO client for many years and they had these amazing assets (photos, videos, interactive 3D walkthroughs, etc), but their old website wasn’t well equipped to truly capitalize on them. 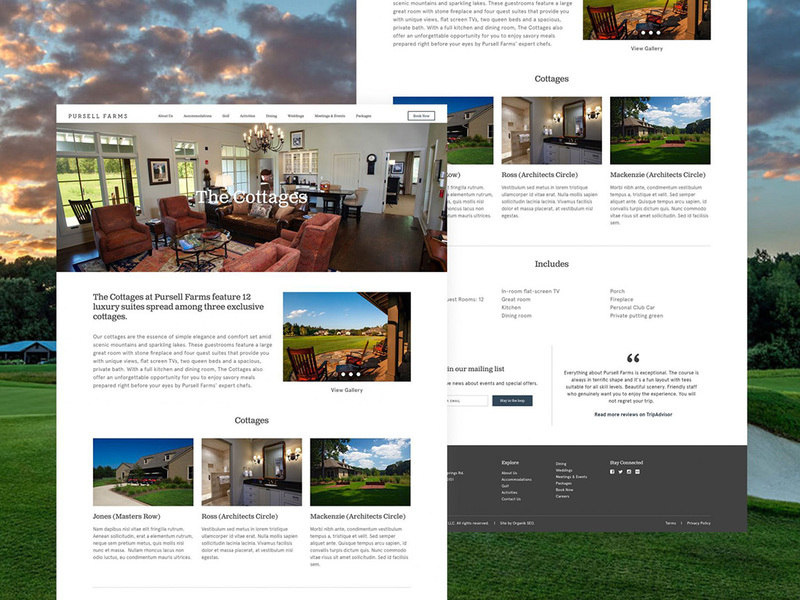 While the primary impetus for redesigning at that point in time was to integrate a booking system (something the old website couldn’t do either), I knew we had an amazing opportunity to leverage Pursell’s brand story and massive library of assets to truly showcase what it was like to stay at Pursell Farms. We also utilized the principles of atomic design. This enabled us to do one of the things I’m most proud of: develop a custom, extremely flexible, content layout system that actually powers every page on the website. Because of this, Pursell is able to create entirely new pages and rearrange layouts completely without any programming intervention required. Since launch, Pursell has reached out to us a handful of times to develop new functionality or pages. But for the most part, they have absolutely been rocking it independently of us, because we built them a system that empowered them to truly own their website. Frankly, I wouldn’t have it any other way.